Are you worried about frozen pipes or septics and sewer lines freezing? You know I love living in Evergreen, Denver's upscale mountain suburb. But, it is similar to living in the real mountains like Aspen or Vail in that there are some high altitude considerations that homeowners on the "flatlands" just don't have. 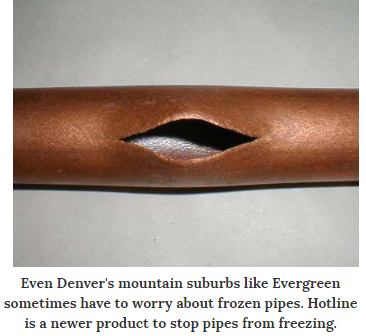 Evergreen property owners have always had concerns for freezing water lines. They don't always need attention but sometimes waterlines are prone to freezing depending on where they are located The repairs up until now involved digging up water lines to wrap pipes with "heat tape." It's expensive ($3,000 - $10,000 depending on the location, cost of contractors, trenching and repaving driveways, etc) and the solution draws a lot of expensive power - 120-240 volts of AC. The problem happens everywhere so when I recently heard about a less expensive, long term solution, I was thrilled! A product called HotLine was developed in the 70s by Melvin Young. Recently, Blair and Kay Corder purchased the patent and updated the product for use around the world. And the world has responded! They have distributors in Canada, throughout the United States from Maine to Alaska, and now in Ireland so the product will be available throughout the UK. The "HotLine" operates from a safe, low-voltage (6 - 30 volts AC depending on the length of the line) heating element, similar the draw of a child's Lionel toy train. The element is a heavy gauge wire of alloy wrapped in a copper or plastic tube. It works on an energy efficient "step-down transformer" and operates well for pipes up to 100 feet long. Kay Blair tells me the typical cost is about $11/foot for the product. They install about 100 of these products every month. Home Owners report that their energy efficient gas furnaces or hot water boilers sometimes create condensation that drips into the sewer or septic lines and freezes. The "HotLine" is solving even these issues. Email me for a list of contractors that work in the Evergreen, Conifer or other Front Range Areas.